Get your feet wet with this newly formed Oregon Country Trail any week day or week end. Crossing the Willamette River at the Calapooia River, the trail leads you through Historic Downtown Albany to visit unique restaurants and Albany's Historic Carousel and out to wineries. Check-in at Edelweiss Manor B&B across the river. A scrumptious breakfast is part of your stay. Then, put on your walking shoes and hit the trail (you'll need the car too). Head on down to First St. for espresso at Brick & Mortar Cafe. The Historic Carousel and Museum is open now, so meander on down First Avenue for a tour and a ride. Then waltz down to Montieth River Park, where they have Mondays at Montieth and River Rhythms concerts in summer. For lunch, head back First Avenue to First Burger, for hand crafted burgers and fries. They make it all from scratch, even the chili! Or hop in the car and get some pub food and homemade microbrews at Calapooia Brewery. Now it's time to explore the country. 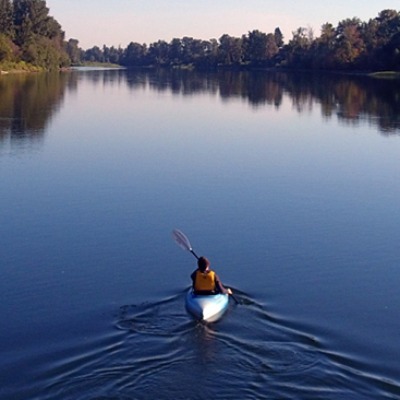 Cross the Willamette and head to Midway Farms for fresh produce, milk, and baked goods. A family member will be there with friendly conversation. Ask if you can visit with their famous cow, Heidi. 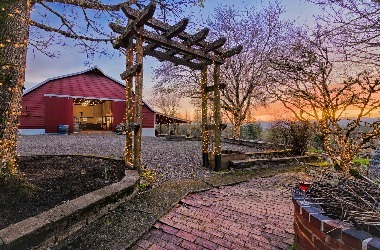 Just up the hill from Midway Farms, Springhill Cellars is a family-owned winery producing award-winning Pinot Noir and Pinot Gris in a beautiful vineyard on Scenic Drive. They also occasionally make a crisp, light and fruity Pinot Noir Rose', which they call " Sagnee' "
Consider Sybaris Bistro. Sybaris is dedicated to bringing the best of Oregon to your table, much of it from local farms, served with equal parts eclecticism, classical preparation, and innovation. Sybaris offers a fresh menu every month, a spacious upscale atmosphere, and an extensive Northwest-centered wine list. After dinner, see a play at the Albany Civic Theater or a movie at the Pix Historic Theatre, where wine is served after 7pm. Then Vault 244 for a nightcap, and back to the B&B for a good night's sleep. You can do the Historic Albany Downtown walking tour of over 700 Historic Homes and buildings tomorrow! If you can't wait to get back in the water check out the The North Santiam River, a 92-mile (148 km) tributary of the Santiam River in western Oregon in the Cascade Range on the eastern side of the Willamette Valley east of Salem. Blocked by Big Cliff Dam near Mill City, the lower North Santiam River supports spring chinook salmon and summer steelhead. In the reaches upstream of the dam, the river is managed mainly as a stocked-trout fishery.